Honestly, I wasn’t entirely sure what to do with my website for the longest time. I’ve decided that I’ll turn my blog into mostly book reviews, but sprinkled with some random articles about topics that interest me. I’ll start with reviewing a book that I read recently but has become one of my favorites! 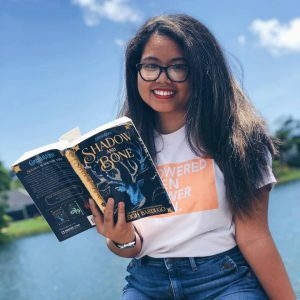 This book is An Ember in the Ashes by Sabaa Tahir! If you’re a fan of a fast-paced adventure that will have you struggling to put the book down, this book is for you. The book begins with Laia’s grandparents being brutally murdered and her brother whisked away to prison. Laia is left having to fend for herself and figure out how to save her brother. I loved reading Laia’s character develop throughout the story from this shy girl who doesn’t believe in herself to a resilient girl that will do whatever it takes to save what she loves. Elias’ story starts off at Blackcliff Academy; a school that trains children to be cold-hearted murderers. The problem? Elias’ does not agree with the school’s ideals and has plans to desert days before he’s supposed to graduate from the very school he loathes. The more I read about Elias, the more I just wanted to protect him, because he gets into all sort of trouble just for being steadfast in what he believes in. I was enthralled with this book from the very start and this book made me feel SO MUCH. I was nervously turning each page because I wanted to know what happened next but I was also so scared to find out. I felt for ALL the characters, regardless of if they were good or bad, because this book also did a wonderful job of humanizing the villains in the story. It was overall, a book that captivated me and left me wanting more. I read the sequel, A Torch Against the Night, soon afterwards and I loved it just as much as An Ember in the Ashes! A Reaper at the Gates comes out next month and it is one of my anticipated releases of 2018.